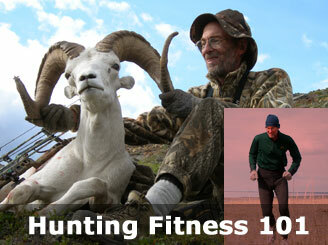 FOR MOUNTAIN HUNTING, FITNESS may be your most valuable hunting tool. Let's face it, big game animals are no respecter of persons. They live in the toughest places on the planet, and you not only have to reach them but also function at a high level when you get there - day after day. Physical endurance is your friend. Here's how you get it. CARDIO FITNESS. Essentially you can gauge the value of your training on heart rate. To gain cardio fitness you have to raise your heart rate to a prescribed training level. The commonly accepted formula is 220-your age x .80-.90. For me the formula would be 220 – 66 = 154 x .85 = 131. So I try to do most of my training at a heart rate of at least 131. To learn more and to quickly calculate your training heart rate, Google "training heart rate." The larger the muscles you use, the faster you will achieve maximum training effect. Here are some excellent cardio exercises, ranked roughly by their training value. Running. This is No. 1 because you must push all your weight forward with the largest muscles in your body - legs - and you use all your muscles - legs, core, shoulders, arms. If you're overweight or out of shape, start by walking, and then progress to jogging and running as you get in shape. Other great cardio builders are the Stairmaster, NordicTrack, elliptical, treadmill, and other machines that rely on the legs while bringing the entire body into play. Work up to a minimum of an hour a day, four to five times per week. Also, incorporate specificity training - exercise that closely mimics your end activity, namely hiking. If you live near hills, do a couple of hard hikes every week, starting with a 20-pound pack and working up to 40 or 50 pounds. If you live in flat country, climb stairs. I have spent hours backpacking the stairs at a local school football stadium. Cycling. Biking doesn't give the quick cardio returns of running because you (probably) cannot hit your training heart rate as quickly. That's because you're essentially using only your legs, and the bike seat supports most of your weight. At the same time, on a bike you can push yourself to the point of exhaustion without the pounding and pain you might suffer from running. Personally, I can ride a bike to exhaustion (three hours or longer), and suffer no residual effects, whereas running at that exertion level would lay me up for two or three days. When possible, ride on the roads. If that's not possible, hop on a stationary bike. Or get a trainer for your bike, and ride while you're watching TV or training DVD's. Swimming. Building cardio endurance by swimming can take even longer than by running and biking because the water supports your weight and you recruit smaller muscles. You have to go all-out to reach the same heart rate you would achieve easily in running. Still, I strongly advocate swimming for mountain hunting. An hour of hard swimming gives you a good cardio effect, and it gives you a solid upper-body workout. Most people who do nothing but run or bike have weak upper bodies. Swimming - and water jogging - work wonders if you're injured or badly out of shape. While preparing for the Boston Marathon, a friend of mine hurt his Achilles tendon and couldn't run. So the last two months before the race he jogged in the pool (up to two hours per session!) to stay in shape. Without the impact of running on solid ground, his Achilles healed, and he ran Boston in 3:30. MUSCULAR FITNESS. While cardio fitness builds a strong engine, muscular fitness builds a strong chassis. The buzz phrase these days is core fitness, but for good reason - a strong core supports the entire body. If your core melts down, the whole body goes with it. You see this in long races as runners start to slump and lose their posture. At that point, they're toast. Think how much quicker it will happen in the mountains as you carry a bow and daypack and fight your way up steep slopes. To keep going hard all day, build a strong core and musculature. I suggest you do a good core/weight session at least a couple of times each week. The following exercises are a good starting point. * A strong cylinder. Your abdominal cylinder supports the rest of your body. Build it with situps or stomach crunches. Do as many as you can. Then do some backups to strengthen your back. Lie flat on your stomach, arms and legs fully extended, and raise your arms and legs off the floor. If you can't do this, alternately raise your arms and legs. Back curls on a physio ball are also good. If you have access to a gym with free weights or machines, do leg presses (squats), lunges, toe raises, knee extensions, bench presses, biceps curls, and triceps extensions. This regimen will strengthen most of the muscles you use in hunting. With newer approaches like the TRX, a strap attached to the wall or ceiling, you can do pull-ups, pushups, squats, lunges, and other exercises. I've even done the TRX routine in hunting camp, using a 20-foot length of nylon webbing as a poor man's TRX. Kettlebell training will give you a great workout, too. DIET. During a long hunt, you wouldn't carry a load of rocks in your pack just for fun, so why carry a load of fat? Not only does fat indicate you're out of shape, but it's also as functional as the rocks. In short, for aggressive mountain hunting get as lean as possible without sacrificing strength. You probably will not lose weight simply by exercising. A friend of mine works out religiously, but he remains overweight because he eats too much - and eats fattening junk foods. To lose weight, or to stay slim, you have to combine exercise with good eating habits. That doesn't mean you have to go wacko to stay slim. A little common sense and self-control will do the trick. Several years ago I weighed 185 pounds, but 20 pounds of that was nothing but a spare tire around my waist. Tired of packing that around, I vowed to get rid of it. Combining some eating restraint with exercise, I dropped to an ideal 165, and I've held that weight ever since with a simple plan: 1) Cut out the ice cream. As an ice cream-aholic, I had to break the habit (with the exception of birthdays and an occasional celebratory Coldstone after a great hunting trip or race). Maybe your weakness is soda. Drink water. Identify your weakness and go on the wagon. 2) Stick with two helpings. I used to eat until I could eat no more. Now I hold myself to two reasonable helpings. That's my simple diet plan - quit eating like a pig (well, in terms of quantity). In short, you don't have to become a diet fanatic to maintain an ideal hunting weight. Just cut out the excessive and unneeded calories (soda, beer, ice cream, rich deserts, pizza, etc. ), and eat servings proportionate to your level of exercise. Follow this simple exercise/diet plan, and you'll conquer the tallest of mountains and biggest of big game. Dwight began bowhunting and writing outdoor stories in 1971. For 25 years he made his living as a freelance writer, and for the past 16 years, until his retirement on May 31, he has served as Editor for Bowhunter magazine. He continues on with the magazine as Hunting Editor. He has taken 23 species of North American big game. To prepare for his hunting adventures, he has become a self-professed gym rat. Since turning 60, Dwight has completed the Los Angeles, Seattle, and Boston marathons; the Bighorn 50K, Bighorn 50-mile (twice), and LeGrizz 50-mile trail runs; numerous sprint and Olympic distance triathlons, and the 70.3 Boise Ironman triathlon. On May 7, he finished his first full ironman-distance triathlon, the St. George Ironman, in 16:04.